Try it Tuesday has come early this week. I have something else planned for tomorrow, so you get to see my latest Pinterest finds today! Thanks to fall and the people I follow on Pinterest, today is all about pumpkin goodies! 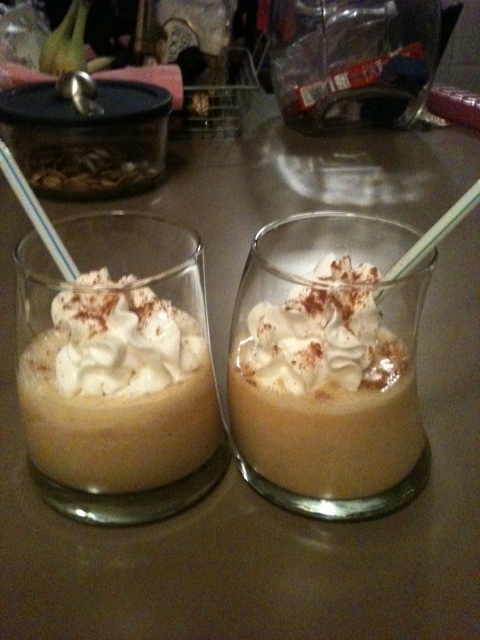 The first I found from a healthy-eating site; a pumpkin pie shake! It looked yummy and I couldn’t wait to try it! 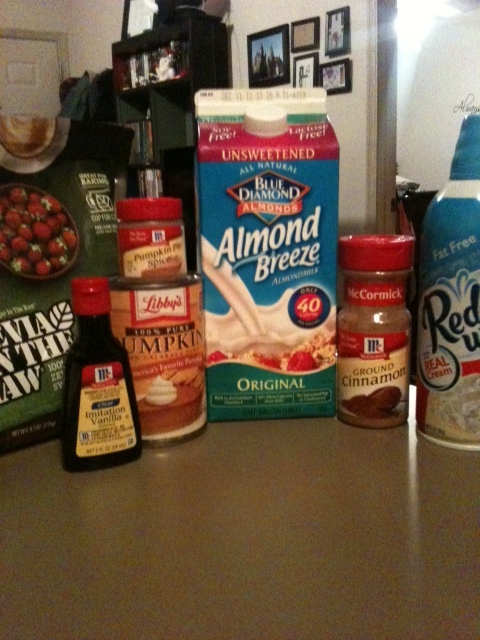 I gathered my ingredients and whipped it up. Can you see the Tetris bookshelf in the background? I followed the recipe exactly and used Huff the Hubs as my guinea pig. I need fancy glasses. And umbrellas. It was… pretty good. If I were to do it again, I’d add in more ice (mine was very liquidy) and a Splenda packet (the unsweetened almond milk was very bland). It wasn’t awful but it wasn’t my fave. 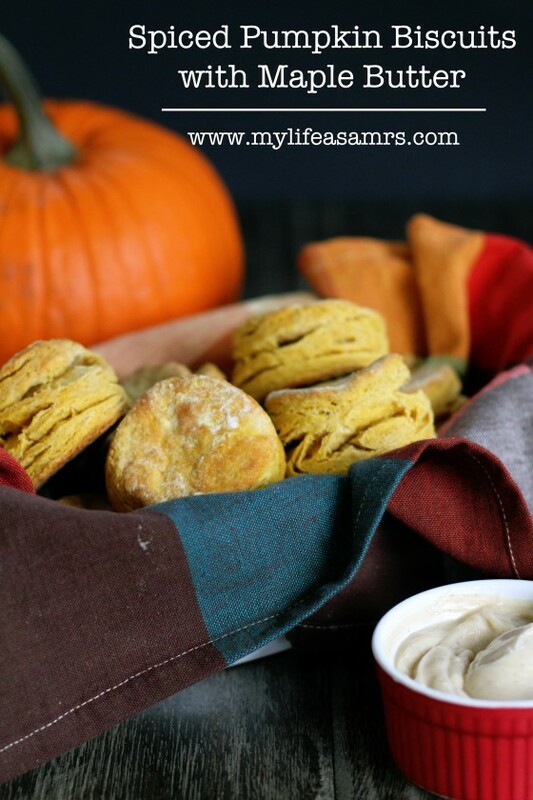 The next recipe I tried was for pumpkin biscuits! 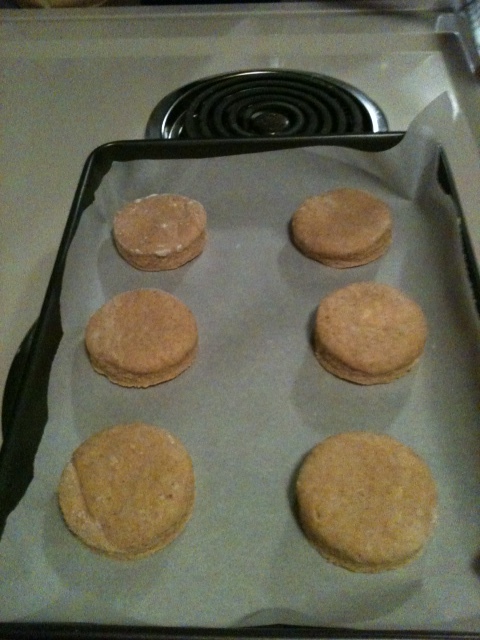 I was a little afraid of making homemade biscuits. 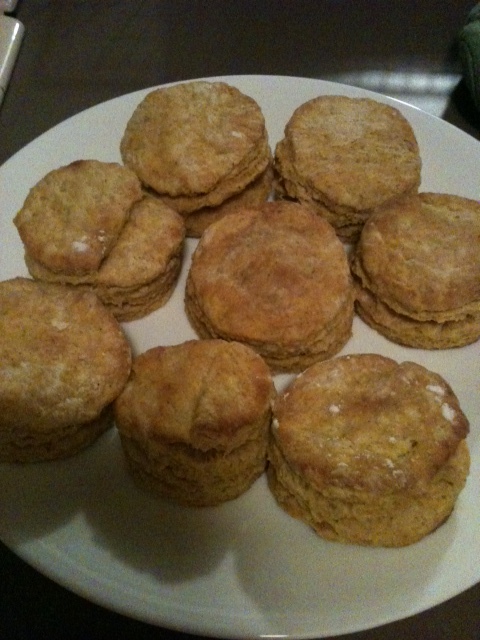 I’ve heard that homemade biscuits aren’t as flaky as the canned kind. I was hoping and praying that my biscuits didn’t turn out like my first loaf of bread. I let them back for about 11 minutes and, thankfully, they turned out flaky and delicious! There was also a recipe for maple butter, but I didn’t make that. I did, however, use Laughing Cow Cinnamon Cream Cheese Spread on one (yes, one of the many biscuits I ate) and it was DELICIOUS! This entry was posted in Uncategorized and tagged biscuits, breakfast, dessert, food, pumpkin, shake, Try It Tuesday by huffmanpost. Bookmark the permalink.